A large bowl of hot and nice wonton soup is my saver on a hectic day. Everyone in my family is just loving it. I often make a large batch of wontons, and deliberately keep some in my freezer. 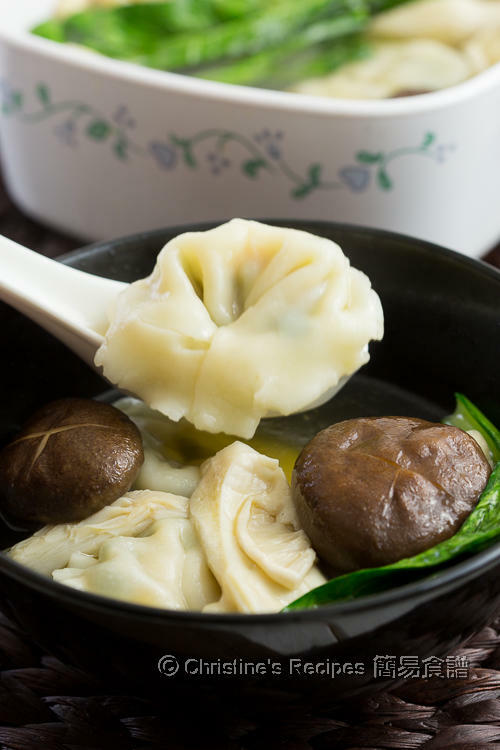 Whenever anyone in my family is craving, the frozen wontons can be turned into a bowl of delicious wonton soup on the go. Needless to say, the freshly made wontons are the best. You can add some mushrooms or any of your favourite vegetables to take this soup up to a level. Devein prawns. Mix with 2 teaspoons of corn flour (corn starch). Leave them for about 10 minutes. Rinse and wipe dry. Cut each prawn into 2 to 3 portions. Set aside. Mix pork mince with marinade, prawns and chives well. Chill in fridge for 20 minutes. Remove the filling from fridge. 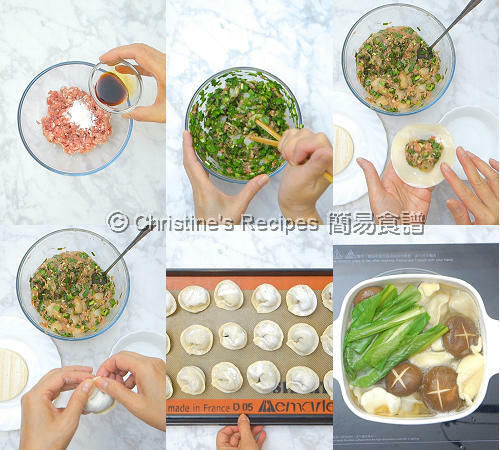 Place a large heaped spoon of fillings in center of wonton wrapper. Dip a finger in the little bowl of water and run along bottom edges of wrapper to moisten. Use your favourite method to enclose filling tightly. (Tutorial video showing how to wrap a wonton.) Repeat with the remaining filling and wonton wrappers. Carefully put wontons into a large pot of boiling water. Immediately swirl the water with a spoon or chopsticks to prevent the wontons from sticking to the bottom or sticking together. When the wontons float to the surface, cook further 2 minutes. In the meantime, use another large pot. Bring chicken stock to boil over high heat. Put in fresh shiitake mushrooms, oyster mushrooms and vegetable. Transfer wontons into the stock. Season with salt. Serve hot. 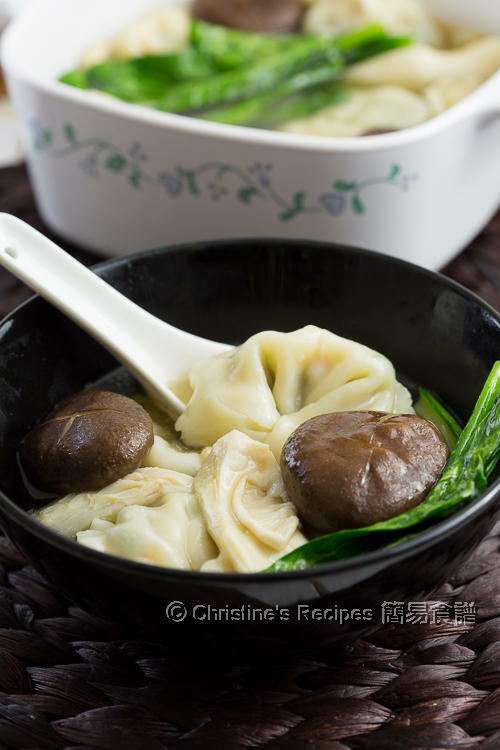 Use another pot of boiling water to cook wonton because you don’t want the stock becomes cloudy. You may use Choi Sum, baby bok choy or any seasonal vegetables. The uncooked wontons can be kept in freezer up to 4 weeks. Simply place them on a tray lined with cling wrap. Freeze for about 30 minutes, or until frozen. Transfer into a sealed ziploc bag. When you’re ready, just put the frozen wontons in boiling water and cook until they float to water surface, then cook further 2 minutes. Comforting, delicious and healthy..I would love one large bowl now.